A national culture, sports and tourism festival opened in Ninh Binh City, the northern province of Ninh Binh, on October 28. In his opening speech, Minister of Culture, Sports and Tourism Nguyen Ngoc Thien said the event is part of activities to celebrate 1,050 years since the foundation of Dai Co Viet, the first centralised feudal state of Viet Nam. In 968, Dinh Bo Linh defeated 12 warlords to become king. He named the country Dai Co Viet (Great Viet) and set up the capital in Hoa Lu, which is now Ninh Binh. More than a millennium has passed, but the cultural and historical values of the former capital remain, he added. Thien noted the festival aims to popularise the cultural, sports and tourism potential of the province and improve authorities and the public’s awareness of the need to develop an advanced Vietnamese culture imbued with national identities. Various activities will be held during the festival, including exhibitions of environmental protection-themed posters, photos and paintings on heritage lands and Ninh Binh’s landscapes and people, and old documents and antiquities. Other cultural and tourism events will also take place to promote local tourism. Chairman of the Ninh Binh provincial People’s Committee Dinh Van Dien said he hopes that through the festival, visitors will enjoy famous scenic landscapes and learn about local culture. Aside from historical relic sites, the province is also known as “Ha Long Bay on Land” due to its limestone mountains rising out of paddy fields. The most famous local attraction is the Trang An Landscape Complex. It was recognised by UNESCO as a world mixed cultural and natural property, the first of its kind in Southeast Asia. 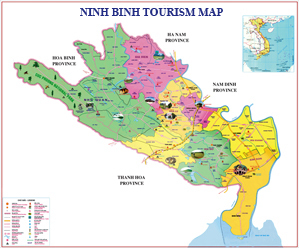 Copyright by Tourism Promotion Information Center – Ninh Binh Administration of Culture, Sport & Tourism. Responsible: Pham Duy Phong, Director of Ninh Binh Tourism Promotion Information Center.